Washington National Insurance Company is today among the fastest growing insurers operating in the country right now. Washington National Insurance Company was founded in 1911 with its current headquarters at Carmel, Indiana. It should be noted that ashington National Insurance Company is a subsidiary of CNO Financial Group. Business operations of Washington National Insurance Company can be broadly categorized into five basic types of insurance products – life insurance, health insurance, LTC, disability and supplemental benefits. CNO Financial Group serves 4 million middle-income working Americans and retirees. Washington National Insurance Company is known for offering a wide range of voluntary worksite and individual products to the under-served middle-income customers with products for their life, health, and retirement needs. Some of the services offered by the company include dental, hospital, cancer, financial planning, life, health, LTC, disability and savings plans. CNO Financial Group's principle subsidiaries are Bankers Life and Casualty, Washington National, Colonial Penn, and 40|86 Advisors. Washington National Insurance Company and its sister companies are currently servicing over one million insureds as well as 25,000 employer groups. Washington National Insurance Company is recognized by all top ratings providers, including a Standard & Poor's and Fitch rating. Stand-alone Med Sup & Term Life Quoters for those that already own a website! 1. Signup to Free Insurance Agent Website. 2. Instructions for HTML code in Back Office. Our daily conference call Weekdays Noon & Sundays 2pm ET will teach you how to get the top of Google. 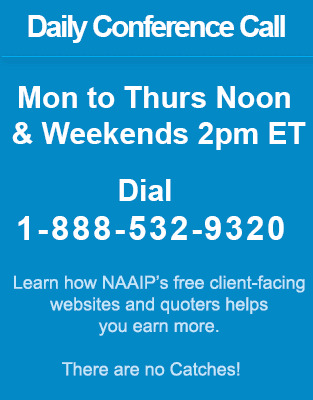 Let NAAIP help you earn more! Step number #1 - NAAIP's insurance website helps agents project themselves as top level professional with minimal time and effort. Phone company - $15/month, click-to-call - Google recommended. [email protected]: Illustrations/Expert advice for all situations. Don't be shy. We are here to serve you. Give every detail of your prospect. You will get expert advice as to which product to sell. Copyright © 2019 - National Association of Accredited Insurance Professionals - NAAIP - Insurance Agent Websites.